Marley Fest is an annual one day music event celebrating & honoring the life, legacy & music of Bob ' Robert Nesta' Marley, Crowned King of Reggae Music in Malta. 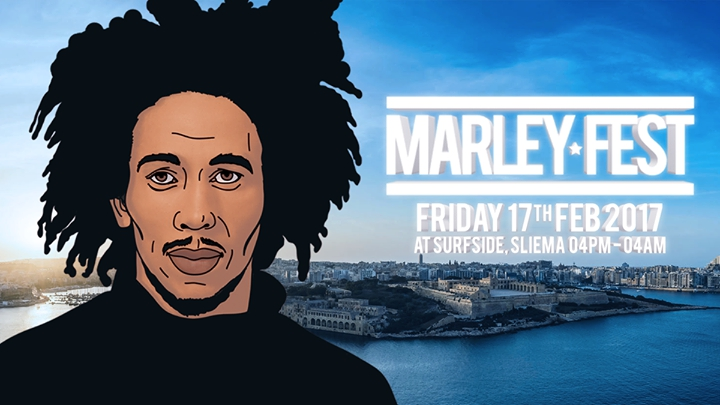 After a huge success of the first edition in 2016 bringing audiance and party goers from all across Malta, we invite you to the second edition at the newly renovated Surfside in Sliema. More info on line-up out soon! Can't wait for Marley Fest??? Then join us at the official Warm Up Party on Sat 4Th Febraury with our friends from Gozo for their Sunscape Festival 2017 Launch party.